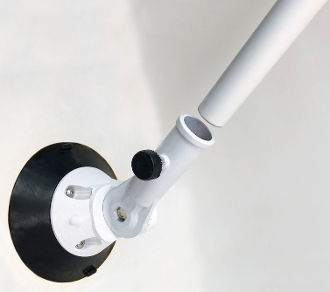 Spinner Pole is the answer to someone who doesnt want a flag pole that goes above the RV. This unit is a simple way to fly a flag from your RV, Auto or other flat surface. It mounts using a built in pump vaccum cup. Cup mounts to mounts easily to the front window or side surface of your RV. This mount is simple to use. ~ Two peice 6ft Spinner Pole with flag clips.